It would be a challenging task to find the best camping knife as there are a lot of options for you to choose from. A good knife should meet all of your requirements and preferences. For example, it should be easy for you to cut wood for firing, dressing a small animal or any other survival needs. Therefore, in case you are searching for your gear and equipment for your first camping trip, it is of utmost importance that you spend time and effort searching for a good camping knife. Read this guide below to see what features you should look for in the best camping knife. You can also read an additional review of the five best ones below. Blade design is one of the most important factors that you need to consider when choosing a camping knife. This feature will determine whether a camping knife is suitable for survival use. There are various kinds of blade designs you can find on the market. However, the three most useful and effective kinds of designs you should look for are the clip point, drop point and sear point. When you use a knife with such kinds of designs, the tip of the blade in designed around the center line of a knife. It will give more control over the tip than other designs of the blades could. Also, these designs are best with camping tasks of both heavy-duty and delicate ones such as dressing fish and chopping small wood logs. Whichever style and design of blades you want; it is a better choice for you to choose a fixed blade knife over a folding knife. A fixed blade knife would take up more space in your backpack, but its advantages overcome this small inconvenience. Most of the fixed blade knives on the market can last longer and are more reliable than folding knives. The joints on the folding knives, no matter how high quality they are, are prone to damage and breaking. Keep in mind that joints of any kind will increase the risk of breaking for the knife. On the other hand, a knife with a fixed blade is sturdier and will not break easily. When you look at the edge of the blade, you may wonder whether to go for single edged blade or double edged blade. In most of the cases, a single edged knife is a better choice. When you need to pry or baton wood, you will soon realize that you cannot do it with a double-edged knife. Also, for a person who tends to add more pressure to the knife by placing his thumb on edge, a single edged knife would be safer. Another factor that you need to consider in the blade edge is the type of it. There are three main types namely the positive rake angle, the neutral rake angle and the negative rake angle. The neutral rake angle is the most common type of blade edges, which you can use for both heavy duty and small job. The positive rake angle can enhance your pressure when you cut something, making it more suitable when you need more power for a heavy-duty task. And the last one, the negative rake angle is more suitable when you do a delicate task. This is because it is designed to reduce the pressure you apply on the knife. The size of a camping knife is another important factor that you need to consider. Many people might think that a knife would be more powerful if it has a bigger blade and handles. That might apply to other things, but not a good camping knife. In fact, bigger is not better for some cases. What if you need a knife for small and detailed tasks such as handling a small animal or craving a small wood log? In this case, you will soon realize that a small blade will help you with much more precision and effectiveness. Also, you will have more control over a small knife than a long knife. On the other hand, if you want a knife to handle big tasks such as chopping woods, a small knife is not a good choice. This is because it would not be as effective as a big one. You can think about having two knives of different sizes for different purposes. Or if you want to pack light, you can consider a knife with the length from 9 to 11 inches. An ideal blade could be from 4 to 6 inches. These dimensions would help a knife to both big and small tasks effectively. It is also worth mentioning the weight of a good camping knife. In general, a camping knife is not too heavy, and it would not take up much space in your backpack. However, it is still better to choose a knife which weighs no more than 4 oz. The quality of the steel will determine how durable and sharp your knife is. Therefore, make sure you opt for high-quality types of steel such as the 440C, stainless steel, high carbon steel or 1095 steel. It is worth noting that although they have some particular strength, they also have some drawbacks as well. For example, a blade which is made from high carbon steel is stronger. However, it can be corroded much more easily than a blade which is made from stainless steel. Also, a high carbon steel blade makes it quite easy for you to sharpen. But; it might need sharpening sooner than when you use a stainless-steel knife. Besides choosing a fixed blade, it should be full tang in order to make itself a good camping knife. A full tang knife indicates that the blade and the handle are made from a full piece of metal. It would be more durable and less prone to breaking into parts. Imagine that you have to break a full piece of metal; you can see it is nearly impossible. On the other hand, a partial tang knife will become loose in a short time. Therefore, it will be more difficult for you to chop or baton wood effectively. Another great advantage of a full tang knife is that you can leverage and have more power against a tough object. You can check if a camping knife is a full tang by looking at the knife’s scale. In most of the models, you can see a piece of metal on between two scales. There is a wide range of materials including rubber, fiberglass or micarta. When you feel comfortable gripping a knife, you can control it better. You should avoid buying a camping knife with a plastic handle at all cost. The most durable materials are synthetic rubber polymer, glass reinforced nylon, and dense wood. These types of material do not only help you to feel comfortable while handling them but they can stand well against moisture. If you choose reinforced fiber material such as the G-10 and Zytelm, they can be strong and durable. However, it is not so comfortable for you to use these types of knives when it doesn’t provide much cushion for your hands. The tip of a camping knife comes in many forms such as hooked, rounded or sharp pointed. However, the best form of tip that you should look for in a camping knife is the latter- the sharp pointed one. When you need a self-defense tool against something, a sharp pointed knife can cause damage almost instantly. It is also super effective when it has to penetrate a thick layer. Also, when you need to do detailed tasks including dressing a small fish or handling all types of nuts. 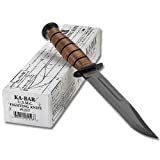 The prices of survival camping knife range a great deal from as cheap as 10 dollars to a few hundred bucks. Price is a signal of quality, and you should not expect a high-quality knife to be cheap. If a knife is cheap, it may be made from the cheap steel. That means it would not deliver a good performance and can be easily broken or damaged easily. If you intend to go camping often in the future, it is a good idea to invest in a high-quality knife. Therefore, it can help you do a lot of tasks and last for a long time. Here is the list of the best camping knives you can find on the market at the moment. Take a look at what you have on offer. This knife has all of the characteristics you would want in a camping knife. It comes with a fixed blade which is made from high carbon and an extra-large ergonomic handle with a high friction grip. A sheath is included to help you keep the knife safe and secure. The thickness of the blade is 0.125 inches with the length of 4.1 inches. The overall length of the knife is 8.8 inches. The net weight of the knife is 4.8 oz., which is quite lightweight when compared to other knives of the same size on the market. This knife is made from high-carbon steel to be very tough and durable. Thus, it can be easily re-sharpened when it is blunt. The handle is made from high-quality material and smart design to be very easy to handle and comfortable to hold. It also helps the knife to perform well even when it is wet or cold. Made with excellent craftsmanship and offered to you at a reasonable price. The sheath that comes along with a Morakniv Companion knife is made from plastic, which is not as durable as the leather sheath. If you need a camping knife for heavy duty tasks, this is one of the best options you can have on the market. This knife is suitable for various activities including batoning, carving and cutting woods. This knife comes with a fixed blade, 1095 Cro-van steel and 100 % of a leather sheath. The blade is straight with the length of 7 inches. It also has a gold-plated brass guard and pommel. Furthermore, it features a deep saber grind and the high carbon steel. The design of the blade is the drop point one, which is suitable for your camping needs. This knife is made with one of the toughest and most durable material to be very sturdy and sharp. Also, it is very compact and lightweight, which doesn’t take much space in your backpack. The leather sheath is made from high-quality material to be very durable and strong. Therefore, it is capable of protecting your knife effectively. The handle is made ergonomically, allowing you to control the knife better. This is among one of the most expensive camping knives you can find on the market. It might break and doesn’t perform effectively when you use it for heavy duty tasks. This type of camping knife is suitable for your small duty and delicate tasks such as craving or handling a small game. If you are a fan of Swedish knives, you would be glad to hear that the brand that makes this knife is not only from Sweden. It also produces products for the Swedish Air Force. They would surely know how to make a good knife for survival uses. This knife has a 3.8-inch drop –point blade, which is made from VG 10 stainless steel. It comes with a real leather sheath to cover the entire knife. The handle material is Kraton rubber. Besides, the overall length of the knife is 11 inches, and the weight of it is 12 oz. This knife can cut easily through various types surfaces and of woods such as normal wood logs and even bamboo. The full tang blade of this knife makes this product even stronger and more powerful. The sheath of this product is made from black nylon and Zytel special material to be very strong and durable. This can be very protective for you blade. This knife is quite expensive. In comparison with other knives of the same size, it is quite heavy. 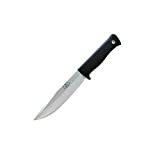 This knife is suitable for your basic tasks including both heavy duty and small duty tasks. This special tool is made from hardened high carbon steel with the length of the blade is 7 inches. The design of the grip is the over mold one which is made from non-slip rubber. Also, the handle is made from the rugged cast aluminum. The design of the handle is ergonomically made. That’s why it’s easy for you to handle the knife and control it for your tasks. The materials of both of the blade and the handle are of high quality, so they’re very strong and durable and would not break easily. The blade is very sharp, which can even be used for cutting and trimming trees and tree branches. The handle is quite tough and would not provide much cushion for your comfort. This product is suitable when you need a tool for cutting, trimming and pruning trees and tree branches. This is not a single blade knife. In fact, it offers you 33 functions. And whatever your needs are, you would always find a function to meets your need. The functions include a large blade, scissors, and a bottle opener. All of the blades are made from stainless steel with polished translucent sapphire ABS scale. The total length of the tool is 3.58 inches with the weight of 6.5 oz. This tool provides a lot of functions for all of your needs when you go camping. Therefore, you don’t have to buy a lot of separate knives and tools. This, in turn, helps you to save a lot of space in your backpack. All of the functions are made with high-quality stainless steel to be strong and durable against corrosion. The manufacturer offers a lifetime warranty on this product. It is one of the heaviest and most expensive tools in this review. The knife is only suitable for small and daily tasks. In case you are looking for a multi-purpose tool, this is definitely what you should choose. It is the best to use for small tasks when you go camping such as handling the small game. A camping knife can be an essential and crucial tool for you if you choose the right one for all of your needs and preferences. It is worth noting that besides choosing the best camping knife you can find on the market, you should learn how to use it effectively. Practicing will help you master the art of using your knife. 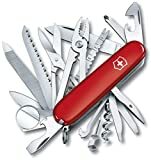 I hope that with all of the tips and reviews above, you would be able to choose the most suitable camping knife. More importantly, with my help, you can use it effectively for your next camping trip.